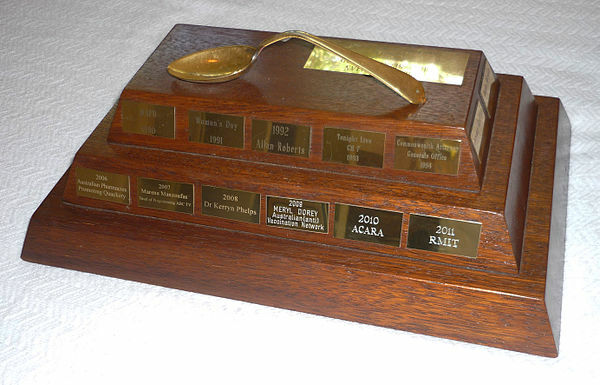 Every year, Australian Skeptics hand out a range of awards – some positive, and the not-so-desirable Bent Spoon. This year’s winners include a couple of key campaigners against pseudomedicine, and one university-based proponent of pseudomedicine. The awards were made at the formal dinner on November 18 for the Australian Skeptics’ National Convention, which this year was held in Sydney. The Bent Spoon is awarded to the proponent of the most preposterous piece of pseudoscientific or paranormal piffle of the year, and is one of the least desirable prizes in the country. Past winners have included Pete ’Paleo’ Evans, the CSIRO’s head Larry Marshall, the ABC, the Pharmacy Guild of Australia, the University of Wollongong, and a psychic dentist. •	The Newcastle City Council for giving ‘the keys to the city’ in July 2017 to Jackie Gillies, “a successful psychic and businesswoman and reality television star”. •	ABC’s Landline program for a segment on biodynamic farming – how to plant crops by the moon. •	Dr (now suspended) John Piesse for his anti-vaccination activities, assisting parents to bypass the “no jab no pay” legislation by providing letters of exemption so their children can avoid otherwise compulsory vaccinations. •	And Aquapol, a company that markets expensive devices which are claimed to exorcise rising damp from your home, using energies unknown to science. In fact, this year’s winner were themselves a past unsuccessful nominee. So we’re happy to announce that the winner of the 2017 Bent Spoon is the National Institute of Complementary Medicine at the University of Western Sydney. Well done, you missed out last year, but you’ve hit the heights in 2017. More information on Australian Skeptics’ past run-ins with NICM can be found here and here. Colloquially known as the Fred, the Skeptics’ Thornett Award for the Promotion of Reason commemorates Fred Thornett, a Tasmanian Skeptic who died in 2009. This award acknowledges a member of the public or a public figure who has made a significant contribution to educating or informing the public regarding issues of science and reason. The award includes a cash prize of $1000. John is a noted orthopaedic surgeon, practising in Melbourne. He specialises in the treatment of spinal disorders. In 2016, he was awarded the Order of Australia (OAM) for services to medicine and the promotion of immunisation. He is also a supporter, fundraiser and spokesperson for Stop the Australian Vaccination Network (SAVN) since 2009, and praised for his constant campaigning for science-based medicine, particularly in regards to the less-than-scientific claims made for chiropractic. So, in recognition of his continued and authoritative exposure of chiropractic misconduct and anti-vaccination misrepresentation, Australian Skeptics is happy to give its 2017 Thornett Award to John Cunningham. Another positive award from the Skeptics is “Skeptic of the Year’, given to those in the Skeptical community whose efforts go above and beyond what can reasonably be expected of committed campaigners. There are many people working away behind the scenes, doing great but often unacknowledged work on behalf of the skeptical movement, particularly in the high profile area of confronting the anti-vaccination movement. This year’s Skeptic of the Year goes to Christine Bayne for her continued work in developing an unparalleled catalogue of activities by the anti-vaccination movement (particularly the tour of Vaxxed, the anti-vaccination film noted for its secret screenings behind closed doors) and for her ongoing role in fighting pseudomedicine generally. Christine works tirelessly out of her country home, far from the day-to-day hustle of the anti-vax movement, and yet she is a key player in the battle with the forces of ignorance.